For those affluent enough to be able to afford it, the European diet grew a great deal sweeter during the 18th Century as the use of sugar became more widespread. This meant a great deal more tooth decay and, shortly afterwards, many more professional dentists2. Dentistry had previously been a minor and somewhat neglected branch of medicine, but now came fully into its own in Europe and North America. False teeth were also a novelty, having been virtually unheard of in earlier centuries3. Previously, troublesome teeth were frequently pulled but almost never replaced and single substitute teeth could only be fitted in otherwise healthy mouths, where they could be tied to the surrounding teeth using silk thread. Even Queen Elizabeth I, who would certainly have been first in the queue for false teeth had there been any around, was forced to resort to plugging the gaps in her teeth with pieces of cloth when appearing in public. Those lower down the social hierarchy just had to grin and bear it, regardless of the poor quality of their grins. 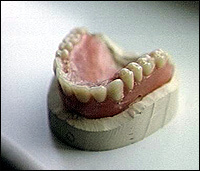 Full or even partial dentures were properly developed only during the course of the 18th Century and the new breed of specialist dentists gradually got better and better at making them fit, coming up with stronger fixatives to keep the teeth attached to them and designing them so as to prevent them from flying out of their patients' mouths every few minutes. Even so, early dentures were often employed more for the sake of appearance than anything else and were, paradoxically, commonly removed in order to eat...soup, presumably. The one area in which change was very slow in coming was in developing anything better than actual teeth, despite experiments with bone and ivory. Porcelain teeth were first created in 1774, but they had a tendency to chip and break � as well as being just a little too white to be wholly convincing � and fully artificial false teeth4 didn't take off properly until the mid-19th Century, once the discovery of vulcanised rubber had allowed for the invention of properly fitting dentures, moulded exactly from the individual patient's mouth. In the meantime, human teeth were much in demand as the preferred option of the wealthy (though animal teeth were occasionally used), not only for the creation of dentures, but also for the rather hit-and-miss practice of tooth transplantation5. Perhaps the most famous set of 18th-Century dentures were those of George Washington, which, contrary to popular legend, were not made of wood but were instead a fine example of the highest quality false teeth craftsmanship of the time, consisting of a denture plate made of carved hippopotamus ivory (elephant and walrus ivory were also used) into which human teeth were then fitted, along with, in Washington's case, parts of the teeth of both horses and donkeys. The problem was that the majority of those teeth used in 18th-Century dentures were of poor quality, diseased and rotten, deriving as they did from less than satisfactory sources. The teeth of executed criminals were certainly highly prized, dependent on the health of the criminal in question, but the agreement of an understanding judge was necessary in order to obtain them. There were other ways in which teeth could be legitimately taken from corpses � where the bodies in question were those of unidentified paupers, for instance � but many more were acquired illicitly, often by graverobbers or by unscrupulous workers in mortuaries or graveyards. The quality of such teeth was rarely good. Dentists had access to teeth they had pulled themselves, but these were also far from ideal, for obvious reasons. Bizarrely, this didn't prevent some dentists, generally those at the less professional end of the new science, from occasionally arranging the immediate transplantation of teeth from one mouth to another: unsurprisingly, the success rate of this procedure was not high and it was later discovered to be an almost sure-fire method of transmitting syphilis. Finally, the desperately impoverished could even be paid for their teeth6 but as with the other sources just mentioned, these were as often as not in a pretty rotten state already. When the Napoleonic Wars began, dental demand found a sure supply, but beyond the sudden abundance, those teeth which could be plundered from battlefields were the most highly prized of all. Why? Which is no use at all if the army in question can't chew. Of the 50,000 men who fell at the Battle of Waterloo, most were young and healthy and their teeth were of a generally good standard, much better than the teeth employed in the majority of dentures. Having been plundered from the battlefield, most of these teeth made their way back to Britain, the country best placed to afford the new top-quality dentures which would incorporate them. These then became known as 'Waterloo Teeth' and were often worn with a great deal of pride, a 'must-have' accessory for fashion-conscious yet toothless members of the more affluent classes of the time. Worn as something like trophies by elderly dandies, the nationality of the teeth in question was actually far from certain in any particular case and the gullible patriot was as likely to be sporting a countryman's molars as those of the vanquished foe. The name 'Waterloo Teeth' quickly established itself as applying to any set of dentures made from young and healthy teeth taken from a Napoleonic battlefield and continued as a term on into the 19th Century, becoming less and less historically accurate as time went on. Indeed, while wholly artificial teeth began to take over from the 1840s onwards, so bringing an end to this rather ghoulish episode in dental history, as late as the 1860s, human teeth obtained from the battlefields of the American Civil War were being shipped to Europe for sale. 1 And, sad to say, the only almost slain. 2 The term 'dentist' itself appeared in Britain during the 1750s, having been imported from France, where modern dentistry began. 3 The Etruscans, who were making beautiful false teeth in the 7th Century BC, were an exception, but the art seems to have died out along with their civilisation. 4 This may seem an oxymoron, but the first false teeth weren't actually 'false' at all, they were just 'borrowed' from someone who didn't need them anymore. 5 A controversial and cutting-edge branch of 18th-Century dentistry which has, thankfully, not survived. 6 One advertisement of 1782 offered a reward of two guineas per incisor, which would be worth about �300 in the present day.